Kitana, a juvenile female rough-toothed dolphin (Steno bredanensis), stranded on August 19, 2009 at Cape San Blas, Florida (2 hrs east of Gulf World). 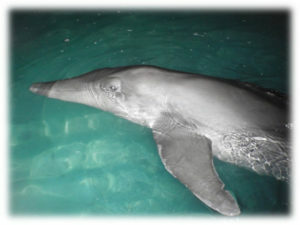 She was brought to Gulf World and was treated for pneumonia, parasites, and severe gastric ulcers. Based on behavioral observation, Kitana was suspected to have some type of hearing impairment. Due to her estimated age and the lack of knowledge of releasing a single animal of this species, National Marine Fisheries Services (NOAA), deemed her non-releasable. After several months in quarantine, she was then socialized with the rest of the steno population at GWMP. Hearing tests later revealed that she had significant hearing loss.